As a creative, I see so much that inspires me on an hourly basis. It’s impossible not to when you subscribe to various social media platforms and see the works of talented individuals across the globe. What doesn’t happen on an hourly basis is the chance to work with those individuals and to connect and collaborate with them. And that’s exactly what happened in the creation of the Sun Tracker necklace. Hayley and Jarod of Apse contacted me mid-spring of 2018 with a concept that rocked my world – they wanted to collaborate with eight local businesses in Bellingham to produce eight items that represented each business. Now, if you don’t know them, Hayley and Jarod own and run Apse Adorn, a jewelry retailer in downtown Bellingham. 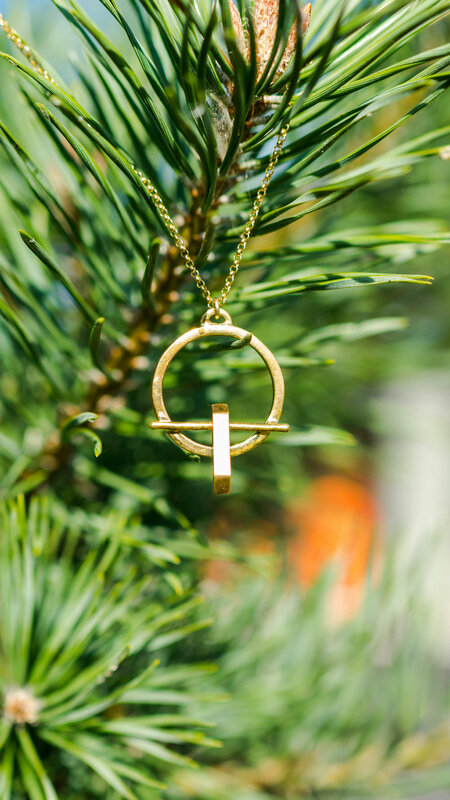 They produce some of the most beautiful and unique jewelry for both men and women, retail wonderfully-curated goods, and on top of that, support local nonprofits. So they tell me this idea and go on to say they want Heliotrope to be one of the eight businesses. Of course I’m ecstatic and agree immediately. Part of the Heliotrope’s values and mission is to truly be a part of our community, and to extend our intention beyond the walls of running a hotel, so this was a great opportunity for us. When it came to designing a tangible object I was a bit outside my normal comfort zone (graphic design and photography), but I had plenty of ideas. I wanted to represent our namesake, Heliotrope. In Latin, it translates to “to track or turn toward the sun”, which made me think of a sundial. Designing a sundial could be cool, I thought, but how about integrating that concept into a wearable piece of jewelry? So I sketched that up and brought it to Hayley and Jarod. They were keen to the idea and did the hard part – bringing a poor sketch and sub-par verbalization to life. Well, of course they succeeded. By mid-summer they had a prototype and we launched the necklace on 10/16/18. We currently sell the necklaces at the hotel, and they’re also available at apseadorn.com. I’d highly encourage anyone and everyone to check out the other collaborations, which are all equally stunning and inspiring. They range from coffee bag clips to air plant holders - I promise you won’t be disappointed. Thank you to Hayley and Jarod of Apse Adorn for inspiring me in my own work, inspiring the Heliotrope Hotel, and for being leaders in ethical and quality design in our community. Dylan Green is the youngest partner of the Heliotrope Hotel at 26 years old. He grew up in Bellingham, Washington, studied music theory in Seattle, Washington, and also studied Public Relations at Western Washington University. Dylan now works as a freelance graphic designer, photographer, and brand consultant. His work and contact information can be found at dylansgreen.com or @dylansantosgreen.